This is a contributing guest blog post from Jenna Wood, a Classy Sales Account Executive, who became an advocate for her favorite cause. This is her story of how she realized one person can truly make a difference. I’ve always wanted to make a difference, but when I think about ways to support nonprofits I often wonder how my small donation could help such a big cause. It doesn’t seem like my $25 gift would even make a dent in the organization’s goal. 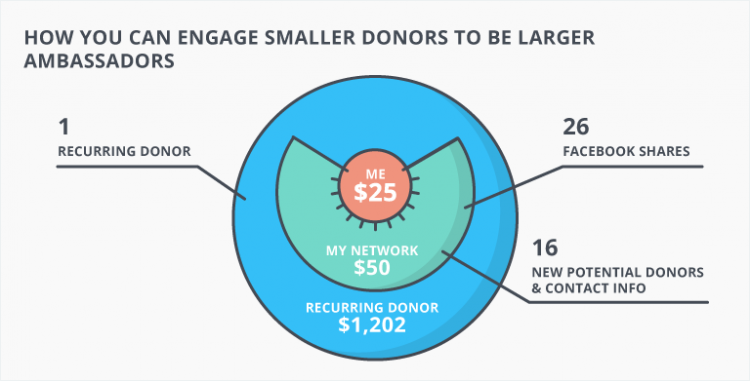 This is a common perception among millennial donors like myself, but my role at Classy has me rethinking this belief. Working with nonprofits for the last two years, I talk about fundraising daily and the impact it can have on NPOs. To truly be able to walk the walk and talk the talk, I decided it was time to try out a P2P fundraising campaign. I wanted to go through the motions on what it actually means to fundraise. This was my chance to experience it for myself. Here’s what happened, how it changed my perception, and what I learned about connecting with a cause. Tapping into the millennial mindset means understanding what appeals to us and why. We want an emotional connection to whatever cause we support. A small NPO from Texas, Love Rescues, drew me in. I felt an immediate connection to their mission to provide education to orphans in Brazil. During my years in college, I was fortunate enough to be able to travel the world and experience life from a different perspective. When I stumbled upon Love Rescues, my experiences came flooding back to me. Learning that there are so many children out there that were not as blessed with education like I was struck me. I felt compelled to get involved. Seeing the statistics on their website helped me see the impact that I could make, and gave me hope that my small contribution could effect change. Because I was so emotionally connected to the mission, I was inspired to try to multiply my donation by drawing others in. Sure, I could have sent my $25 donation and called it a day but they invited me get more involved. They gave me an opportunity to increase my impact and I responded. Through fundraising, I also knew I could re-connect with like-minded people to reach my goal. Over the next three weeks I was able to raise just over $1,200. Because the process is 100 percent mobile, I was able to easily share pictures and videos from my phone, write my own story, and link my social media channels in just a few clicks. With the ability to share my story so easily, I was able to inspire others to support the cause. I thought about my family, friends, and co-workers who would also feel an emotional connection to the cause through me. I was able to upload my Gmail contacts right to my fundraising page and send them a direct message leading back to my page. My supporters started donating $10, $20, $30 dollars to a cause I am passionate about, and each and every donation added up to support the larger goal. Also, casting this wider net of potential supporters allowed me to engage people that the NPO probably would never interact with otherwise. I was able to bridge that gap. My uncle, for example, called me after receiving my email. He wanted to talk about his experiences traveling and teaching English in the same villages the NPO was setting out to help. Right away, he was able to connect with their mission and he wanted to learn more. This just goes to show the impact one person can have on an organization. Because of my emotional connection to the cause I was able to inspire others. And because the process was so easy, I was able to make a bigger impact. My uncle may never have heard of this cause if I hadn’t signed on to become an ambassador for them through my fundraising campaign. I recruited a new donor for the organization and was able to see firsthand the power of peer-to-peer fundraising.